For the detection of Microbial Growth in, Bio-diesel, Diesel, Fuel Blends, Jet Fuel, Heating Oil, and Kerosene. Each self testing and result kit costs $12. 1. Remove small water absorption cushion from 2 oz bottle and discard. 2. Remove small 2ML vile from the 2 oz bottle and set aside. 3. Retrieve your fuel sample from vehicle, storage tank or filler nozzle. 4. Empty the material from the 2ML vile into the 2 oz bottle. 5. Fill the 2 oz bottle with fuel to the 6ML line. (75°- 85° for best results) for 48 -72 hours. 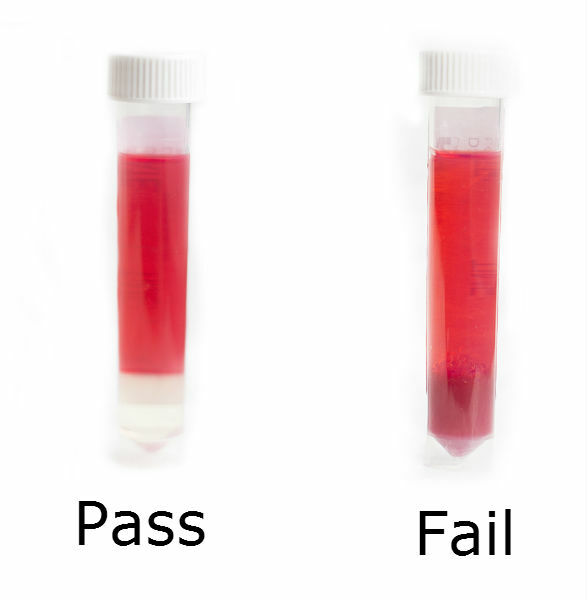 FAIL: Color changes in microbial feeding liquid, or visible mold/microbial growth. There may not be a change in color in your sample, but mold or microbial will still be visible if it’s positive.